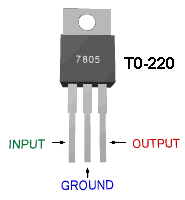 The circuit uses a Positive Voltage regulator IC 7805 to give 5 volt regulated output. The components around IC1 are meant for protecting the IC so as to give smooth output power. Zener diode ZD act as the Input Surge protecting diode. It provides 7.2 volts to the input of the regulator IC from the 12 volt power supply. Diode D1 is the Output Surge and Input Short protecting diode. When a surge voltage exceeding maximum voltage rating of the regulator is applied to the input or when a voltage in excess of the input voltage is applied to the output, the regulator will be destroyed. 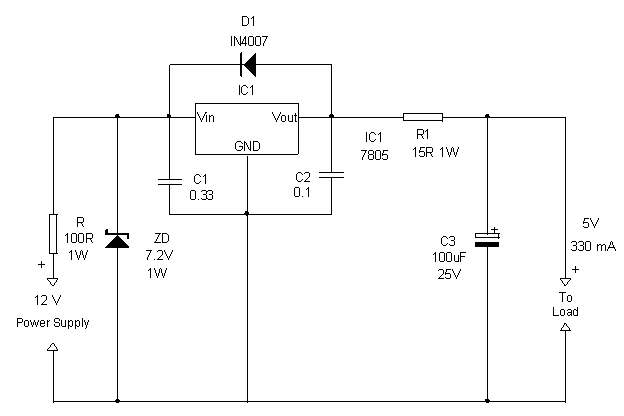 If the input terminal shorts with the ground, the output voltage increases above the input voltage(ground potential)and the charge in the capacitor connected to the output flows into the input side which is also fatal to the regulator. Both these situations can be avoided by using the Zener at the input and the diode D1 across the regulator. Capacitor C1 and C2 provides stability to the regulator and these should be soldered close to the legs of the regulator. Capacitor C3 acts as a buffer to give constant voltage in the output. 7805 IC can tolerate maximum 35 volts and its current rating is 1 Amps maximum. Resistor R1 restricts the charging current to around 330 mA(0.33A) as per the Ohms law. By increasing or decreasing the value of R1, output current can be varied. Use the formula V/ A .